As the first of my two model railroads was developing, back in Pennsylvania, I began taking photos of the model scenery with a train passing through. A friend decorated a scale Christmas tree to put in the middle of my miniature town. Year-end holidays, beginning with Thanksgiving, initiate a special time for me — a time when I begin my assembly-line process of creating and printing holiday cards and bookmarks to insert with each card. My tradition of mailing dozens of holiday cards began more than 20 years ago, after separating from my ex-wife in New Mexico and returning to Pennsylvania to live with my Dad. I wanted to maintain contact with special people, and reconnect with local relatives. I bought and mailed nearly four dozen cards that year, which included hand-written messages, or a one-page typed report on my activities. As the years passed, the cards list grew by several each year — even though I lost contact with some folks for various reasons. Then, because of my continuing childhood interest in model railroading, I started buying only those holiday cards that featured a train on them. For a few years, nearly everyone on my list received one of those store-bought train cards. As the first of my two model railroads was developing, back in Pennsylvania, I began taking photos of the model scenery with a train passing through. A friend decorated a scale Christmas tree to put in the middle of my miniature town. Then I made a merry holidays sign to set on top of one of the downtown buildings — and I took photos of the scene. 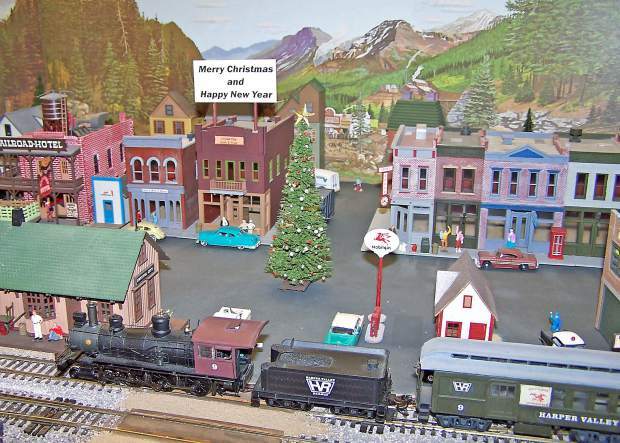 After moving to Montana in 2005, I built an even larger model railroad with buildings, signs, autos and locomotives that would have been seen in mountain towns during the late 1950s. And I took more photos, including new yule scene photos. They show a train passing through the model landscape with the happy holidays sign and decorated little tree on two of the train cars. By then, with my old desktop PC and printer, I had begun creating my own greeting cards. And during the next few years, most folks on my growing list received cards printed with holiday greeting photos taken at the model railroad. Other cards were created with the many flower photos that I’ve taken. Flower photos that accentuate red and green went on some of the year-end holiday cards; and other flower photos were put on the front of one-of-a-kind cards made for birthdays and other events. In addition, I used my photos to print a variety of bookmarks with a different saying on each to match the flower, animal or scene in the photo. They are ideal to give to folks to introduce myself. And I decided to include bookmarks in the holiday cards I mail. Each greeting card must go through my printer at least three times: first to print the photo on the front; the second time adds my information on the back, and often an identification of the photo on the front. The third pass prints the message I drafted, or chose, for the inside of the card. And occasionally I also print a second photo or additional message on the inside of the card. That requires a fourth pass through the printer. Then I use the printer a final time to address the envelopes before signing the cards, enclosing the bookmarks, and attaching postage. A couple years ago, my holiday mailings topped the 100 mark for the first time. This year I prepared and mailed nearly 130 cards. Some folks might question my sanity, and others might call my greeting cards tradition a “labor of love.” Perhaps that’s an exaggeration; but I must admit I do get a certain joy out of the process. It definitely helps me to get into the holiday spirit, and I do get a warm feeling by using it as an opportunity to share my talents and creativity. Of course, it keeps me in contact with some people I haven’t seen for years. But more than that, it’s a way of acknowledging those folks who have touched my life in one way or another, and to show my appreciation. It’s a caring tradition pertinent to the season. Unfortunately, I don’t have the means to send a card to every reader of The Union — to let each know how important all are to this community. This column will just have to fill that void as my opportunity to say Happy Holidays to each of you! 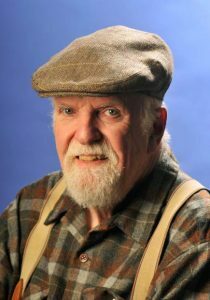 Darrell Berkheimer, who lives in Grass Valley, writes a biweekly column published Saturdays by The Union. Contact him at mtmrnut@yahoo.com.